Then Jesus takes the time to warn one particular disciple. I love and hate the story that we commonly call “The Last Supper.” I hate that one of His own betrayed Him. I love that He is so patient and caring with His followers. I am sad that He had suffering ahead that no man could have ever endured, yet He chooses to spend the Passover with these flawed men. We all acknowledge that this is Jesus’ last supper before His death. 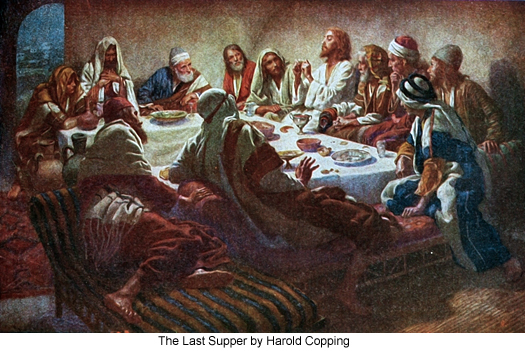 However, it was also their last supper. That night those twelve men ate their last supper under the Old Covenant, under the law of sin and death, under the law of performance. Every supper eaten after that day was eaten under the New Covenant, under the law of love and liberty! It is like a family who live a rough life, barely scraping by, sitting down to the last food in their cupboards. They are grateful for the watery bowl of ramen and a small cup of kool-aid before retiring for the night, only to wake up and find out that they are long lost cousins to the king. Suddenly they are royalty and are swept off to the palace to dine every night at the king’s table. They had eaten their “last supper” as peasants, in their old life, and now they feast with the king in their new life. We would think them pretty foolish if they kept eating ramen noodle and drinking kool-aid for supper, wouldn’t we? Then isn’t it foolish for us to still be arguing over who is the greatest, or trying to stand up to Satan and his “sifting” in our own strength? Why do we want to still submit to the law of performance, or worse yet try to force others to, when we have eaten our last supper there? We are royalty! We are kings and priests. We are children of God. We are seated in Heaven with Christ. We need to stop living under the Old Covenant and live under the New! It’s easier said than done, I know… but we need to repent. We will never change anything (that’s what repent means, changing our direction) until we change the way we think. They say it takes fourteen days to build a new habit. However, you won’t even try until you make up your mind to do something different than what you have been doing. The night before you surrendered your heart to Jesus- you ate your “last supper.” It’s all brand new from there. This entry was posted in Thoughts and tagged Christianity, faith, forgiveness, freedom, God, God's love, God's word, Holy Spirit, hope, Jesus, Lord, Salvation, the last supper.